Raksha Bandhan also abbreviated as Rakhi, is the pious festival of Hindus which came into existence about 6,000 years ago when Aryan created world's first civilization. Before going to the battlefield, they used to perform Yajnas with the intention to acquire blessings of God. Sisters tied Rakhi before their departure which reminded them duties and responsibilities towards family and the country. But in the 21st century when people who seek opportunity to make business around occasions like Raksha Bandhan, there’s surely more to it than just rejoicing a festival. Raksha Bandhan which was one of the most awaited days of the year for any brother or sister is now more eagerly awaited by the businessmen. Be it sweets, chocolates, apparels, gifts, or jewellery, each of these business verticals have geared up to encash maximum sales during this time. Speaking about the significance of Raksha bandhan, Pawan Gadia, CEO, Ferns N Petals, said, “After Valentines’ day and Mothers’ day, it is Rakshabandhan that gives us the surge in sales”. Rakshabandhan spells good business and to ensure that, most of the companies want to associate with the season and hitch a sales ride. For this they have changed the market sentiments with wide variety of products and advertisements that come across televisions and print media. Cadbury’s celebrations have changed the way people used to buy chocolates. It has more or less replaced sweets in at least the metropolitan towns. Changing trends is a result of changing variety of products available during the season. If we talk about the designs of Rakhi, till few years back, when it was the normal ‘resham ke dhage’ has now been replaced by a list of improvised rakhis. Talking about the same Gadia said, “Children are the ones who choose rakhis in most of the families, looking at such a target audience, this year we have come up with a lot of cartoon and floral rakhis, made of fresh flowers”. 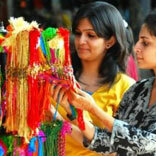 Apart from this, FNP have also come up with Rakhi Thalis, which usually contains fruits, dry fruits, rakhi and flowers. The combo pack starts from Rs 499 and goes upto Rs 4,000. The best selling price bracket is Rs 599-Rs 699. Rajeev Mehra, Director, Styleever and Mishika said, “We wanted our customers to celebrate this Rakshabandhan in a special way, to make the sisters feel delighted we are giving our customers a benefit in the form of gift”. The fashion apparel web portal has offered a free Jewellery box worth Rs 250 and a discount of Rs 250 on any purchase of Rs 1,000 or above. Fashion has been growing at a very fast rate, and any festive season shoots the sales sky high. Rakshabandhan is no exception. Speaking about their plans, Gurprit Sawhney, Promoter, Trendy Divva said, “What becomes rage with consumers becomes stale too in no time, as the trends change super fast, so this time we've got a special Rakshabandhan collection, which includes a range of traditional Indian wear and fusion”. Jewellery is one of the many industries which blossoms in the festival season. Designer Musskan from Proroyal Kiwi talking about Rakhi plans said, “This Rakshabandhan I have come up with a special collection of floral and semi precious jewellery keeping in mind the trend and affordability. I have specially designed jewellery in the price range of Rs 1100 onwards”. The changing trends have replaced the old sentiment of buying Mithais and Ladoos. The number of sweet shops as compared to chocolate retailers has considerably reduced. But does this mean the Indian consumers have forgotten the culture of sweets? Abhilasha Shrivastava expressed, “India still belongs to its culture and despite the fact that chocolates have become a part of the festivals, sweets and are very much a part of the festivals and I always prefer ladoos over chocolates and about the design of Rakhi, I will go for the durable rakhis, the traditional resham ones and not floral as they cannot be on the wrist after a day. And for my young siblings I generally buy the ones with cartoon characters”. In the gift segment, dry fruits and flowers have the largest consumer acceptance today. Compared to last year, this year the prices in general have gone up by 15-20 per cent accounting for inflation in the prices of raw materials. The starting price of a ‘thali’ at FNP which was Rs 399 last year is Rs 499 this year. Jewellery designer Musskan and apparel e-retailer Styleever & Mishka have registered a hike of 40 per cent in the sales compared to last year, whereas Trendy Diva has roped in 20 per cent more revenue than the last year. If we talk about just the rakhi business, despite recession, sale of rakhis in this festival could cross Rs 5 crore, say market experts. Most of the traders are of the view that slight variation in prices does not affect sale much. No one minds shelling out some extra bucks during festivities. Eventually the festival of threads, which promises the well being of sisters, is now working for the well being of Indian businessmen.